A giant steel wall was erected around the Short Strand enclave in east Belfast this week in an unprecedented military operation to seal off the nationalist enclave ahead of one of a number of sectarian Orange Order parades. The steel barricade stretched the full length of the contested section of the route, but only encouraged marchers to breach the rulings of the Parades Commission. In total, 41 steel barriers were erected in an operation that took several hours to complete and covered the entire contentious section of the route. 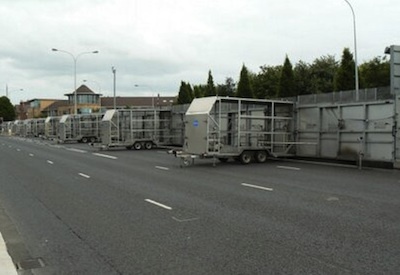 While smaller barriers have been used in the past, this was the first time the PSNI used the new metal wall, brought in for use at last month’s G8 summit in Fermanagh. Around 100 nationalist members of the Sinn Fein-endorsed Short Strand Residents Group held a protest as the march passed on Monday night. Some loyalist bands stopped close to the protestors and played provocative sectarian tunes including the ‘Famine Song’. Tensions have been high between the nationalist Short Strand and loyalist Cluan Place area in recent weeks, with petrol bomb attacks on the homes of Catholics on Bryson Street. Monday’s parade was a ‘Mini-Twelfth’ parade, one of the main marching days ahead of July 12. This day next week, hundreds of coat-trailing marches will take place across the North to mark the anniversary of a 17th century Protestant battle victory. Sinn Fein councillor Niall O Donnghaile said that while the steel wall “seems like a step back”, it had aided the safety of residents. “The cordon is only a temporary measure to what is a long-term problem that can only be solved when the Orange Order talks to residents”, he said. “A key point is that the past two major Orange marches in east Belfast did not go along this route but down My Ladys Road and away from nationalist homes. Nationalists have long called for face-to-face talks in an attempt to come to local agreements on the routes of contentious parades. But the Parades Commission this week issued a ruling to allow one of the major ‘Twelfth’ Orange Order parade to pass the nearby St Matthew’s Church, without restrictions. Mr O Donnghaile condemned the ruling, which came just days after the Commission’s previous determinations had been violated. He also pointed out that the conditions announced for the new parade were even more relaxed than those which they have issued for parades past St Patrick’s Church in north Belfast. He said there had been “breach after breach” of the rulings for Monday’s march. His Short Strand Residents Group will again hold a protest to coincide with the passing of the parade. Meanwhile, a decision by the Orange Order to meet one of two nationalist residents’ group in north Belfast ahead of a 12 July parade has received a mixed response. The north Belfast parade through Ardoyne and nearby communities is arguably the most contentious of the marching season. The Orange Order issued a statement on Friday morning giving their backing to three local lodges who will be involved in the talks with the Crumlin and Ardoyne Residents Association (CARA) -- but not the larger Greater Ardoyne Residents’ Collective (GARC). In recent weeks, there has been an increased polarisation in Belfast and elsewhere between those residents’ groups which are endorsed by Sinn Fein, and those which are not. CARA, a Sinn Fein-supported residents’ group, has not yet issued a statement in response. But Sinn Fein Assembly member for North Belfast, Gerry Kelly, welcome the news of these talks. “The residents group, CARA, is on the public record calling for such talks for some years,” he said. However, a spokesperson for GARC said the move was “a cynical ploy” to “dictate a loyalist agenda” to residents. “This deception will neither work nor fool our community,” they said. Meanwhile, two loyalist parades through Carrick Hill at the weekend saw calls for an investigation into how Parades Commission determinations were once again “smashed”. Sinn Fein Culture minister Caral Ni Chuilin called on the Parades Commission to investigate how their determination was broken. Elsewhere, a contentious Orange Order parade on the Springfield Road passed off peacefully on Saturday amid a tight security operation. The Sinn Fein-supported Springfield Residents Action Group received permission to make a protest during the annual march, which has seen clashes in years past. A relatively small group of Orangemen was allowed to pass through Workman Avenue and along the disputed part of Springfield Road, while the majority of marchers proceeded along an alternative route.